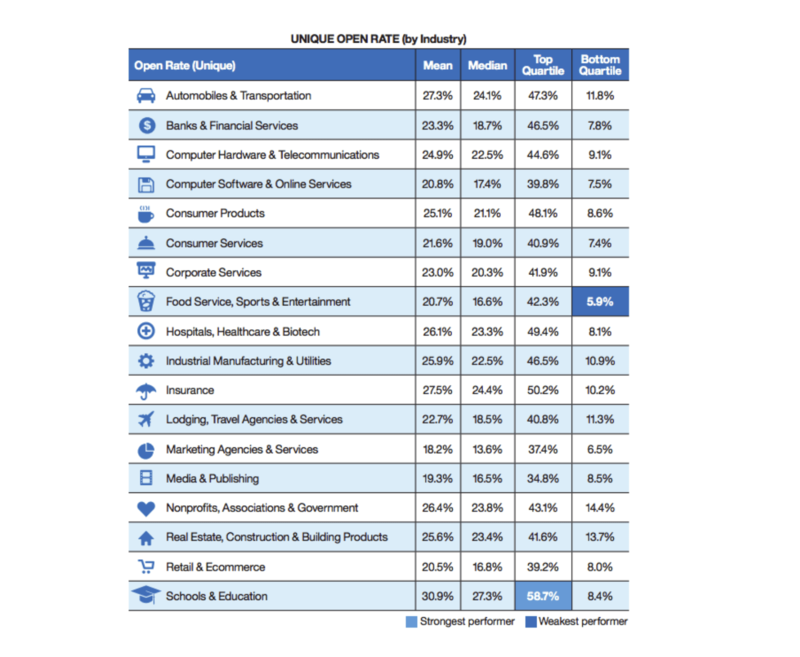 Open rate is one of the most frequently measured metrics in email marketing. And while it might not be as meaningful as conversions and sales, there’s a good reason why we focus on it. If people don’t open your emails, they can’t convert. Even worse, if they aren’t opening your emails, all the work you put into the rest of the message barely matters. Fortunately, there’s a lot you can do to increase your messages’ open rates. And most of it isn’t too hard to do. Keep reading to see how your emails compare to other marketer’s open rates, and for a slew of ideas for how to get more of your subscribers to open every message you send. What does open rate measure? So what exactly does open rate measure? It’s how many people open your emails, right? Well, sort of. That covers how open rate is calculated. But there are actually two types of open rates: “unique open rate” and regular “open rate”. Unique open rate or “unique opens” is arguably the more valuable measurement. You see, regular opens count all the opens that occur. 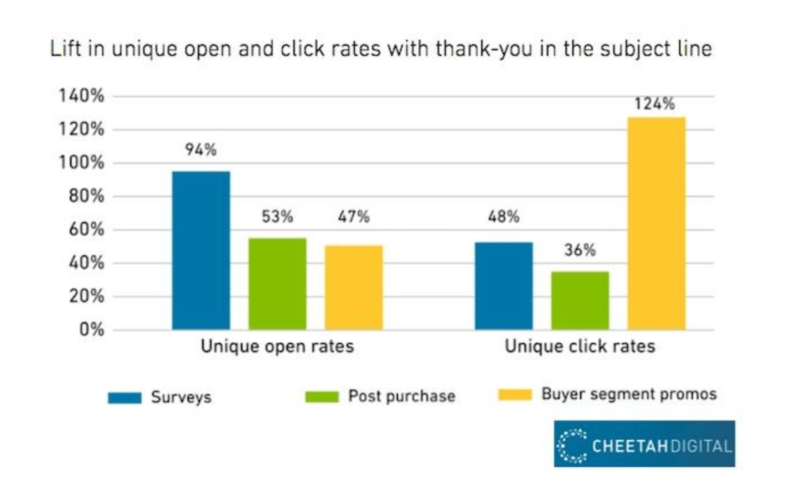 So if one of your subscribers happens to open a particular email, say, five times, each one of those five opens would count toward your campaign’s overall “open rate”. But it would not count toward that campaign’s “unique open rate”. 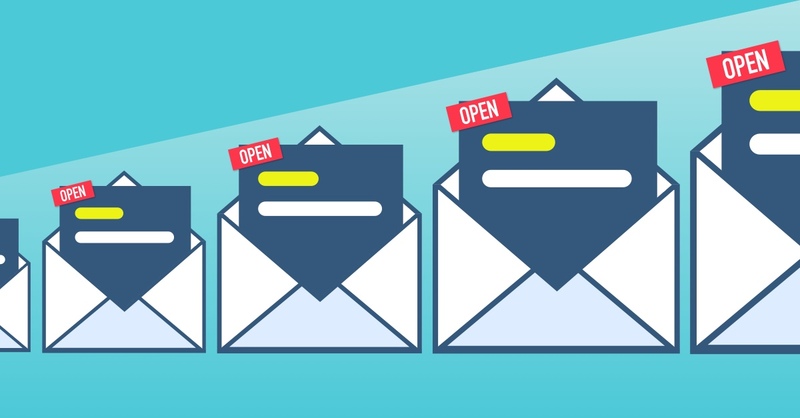 Comparing your unique opens against regular opens can be interesting, because sometimes you can see how a handful of subscribers are really interested in a particular email. But generally, if you want to measure how well subscribers responded to your email, focus on unique opens. Another related metric you’ll see a lot is the “click to open rate”. This is exactly what it sounds like: Of the people who opened your email, this is the percentage of people who clicked. 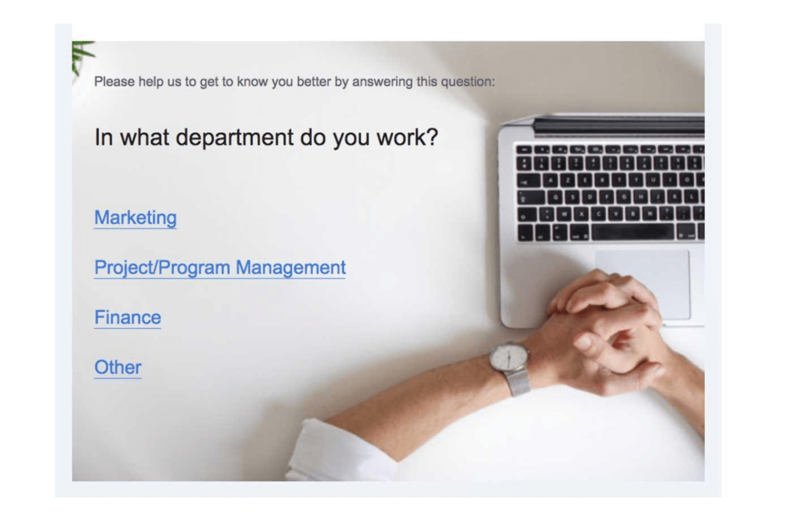 If you’ve got a campaign with a low open rate, but a high click to open rate, it would suggest that your subject line, preheader or sender name aren’t doing their job well enough, or that you could have a segmenting problem. Those particular measurements (low opens, but good click-to-opens) suggest that very few people were interested enough to open the email based on the subject, preheader and sender name. But for the few who did, the message inside was compelling enough for them to click through. This is why it’s so good to track and understand the different metrics. They can give us clues about why a particular campaign worked… or didn’t. Everyone wants to know how their emails compare. It’s only human. So here’s the short answer to this question: Anything over a 20% open rate is good. Anything above 25% is very good. 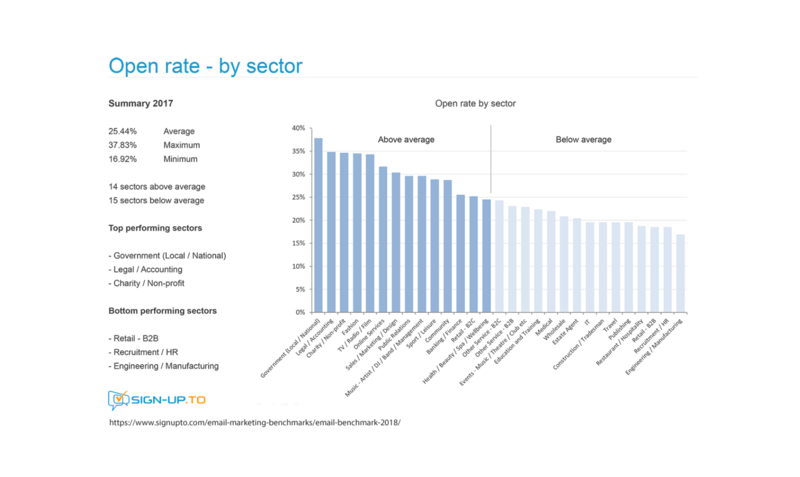 As you can see, a median unique open rate could be as low as 16.5% if you’re in media and publishing, but as high as 27.4% if you’re in schools and education. That’s a pretty wide gap! Hopefully that gives you a good idea of where you stand in your industry. But it doesn’t tell the whole story. Did you see that? 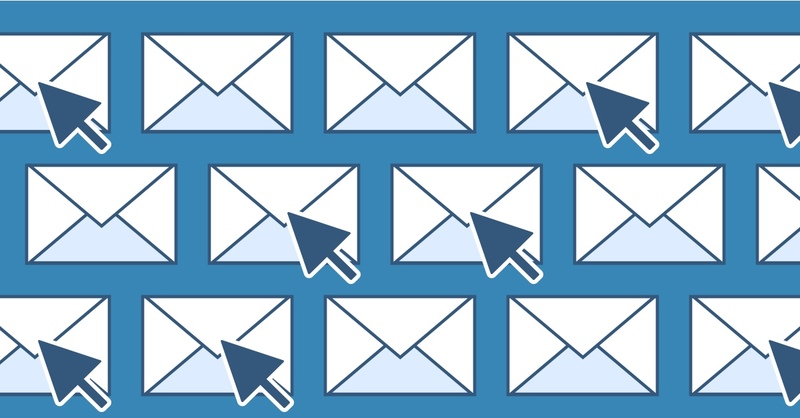 According to this study, welcome emails get nearly four times as many opens as newsletters! The statistics are surprising, but don’t get too caught up with them. What really matters is your own list’s performance. In a way, you’re really only competing against yourself and the emails you’ve sent in the past (unless you’ve got an embedded spy over at a competitor, and you happen to know the stats on how their emails perform). What you really need to focus on is your emails’ average open rate, unique open rate, and click-to-open rate is. If you’re the CMO, you might only want to know the open rate and not fuss with any of the other metrics. And you might want to know just the average open rate for the last quarter, not for each individual campaign. That’s why it’s so helpful to be able to send customized, automated reports for different people. Now that you know where you’re starting from, the next step is to improve. And fortunately, there are a lot of ways to improve your open rates. Let’s start with the most important one first. 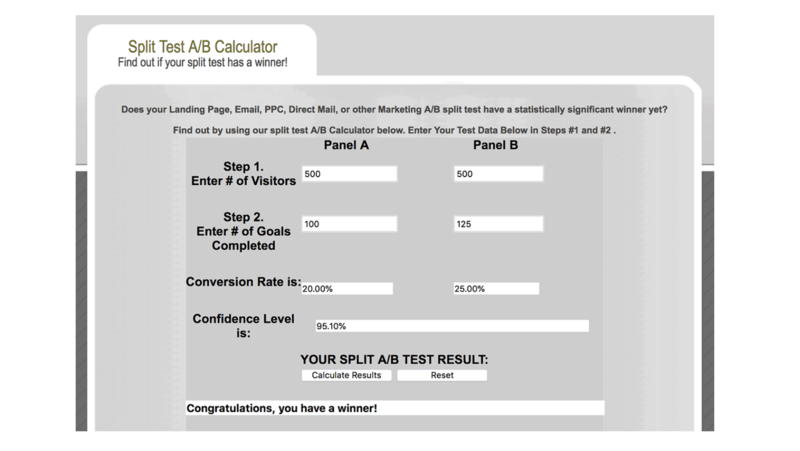 1) Start doing A/B split tests. 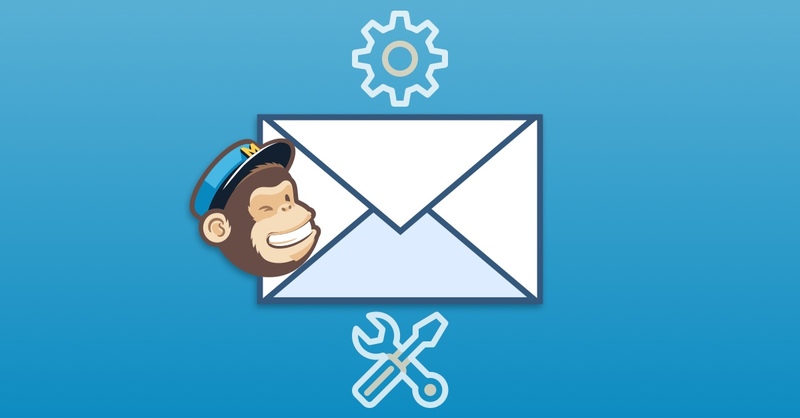 Are you split-testing every email message you send out? If you aren’t, you should be. That’s because without split-testing, it’s going to take a long time to know what works for your list and what doesn’t. And even then, you’ll usually just be guessing. The good news is that most email service providers make split-testing – and particularly split-testing subject lines – really easy. They know most email marketers test all the time, and that they test subject lines more than anything else. 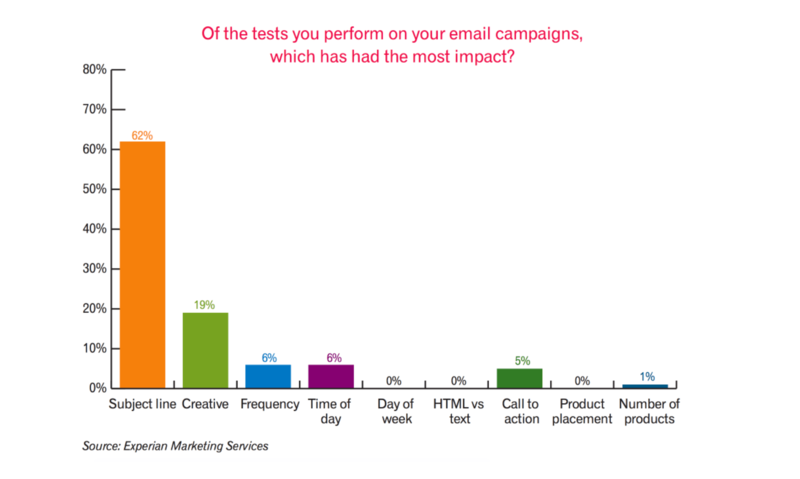 Many email marketers also say that subject lines tests are more impactful than any other type of test. But there is one issue with split-testing. You need a reasonably large list. Not a huge list, but at least 1,000-2,000 subscribers. If you have less than 2,000-3,000 subscribers, you can still try some split-tests, but you’d have to see a really large difference between the two test cells (like well more than 25%) for it to make any difference. 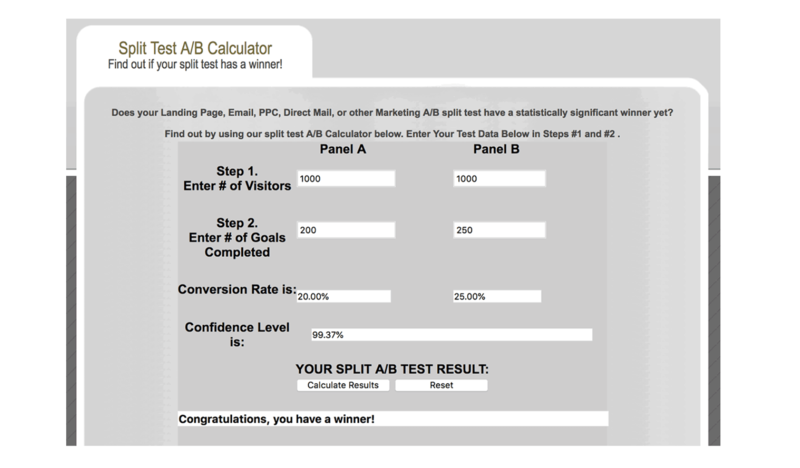 Here’s the results of a split-test as calculated by SplitTestCalculator.com. Note the “confidence level” – it’s 95%. For a sample size this small, it’s risky to use anything less than a 95% confidence level. Even that level of confidence means there’s a one in twenty chance the results are wrong – that what looks like the winning variation isn’t actually the winning variation. Here’s the same test results for a list of 2,000 subscribers. Note how the confidence level has gone up to 99%. Also note how big the difference is between to two conversion rates (we’re counting each email open as a conversion due to the setup of this calculator). Even with a larger list of 2,000 subscribers, you’d still need a pretty big difference between two emails to make this a valid test. If you have a small list, and still really want to test, you can “cheat” by testing the same thing two or three times (like split-testing a subject line with and without subscribers’ first names). It will take longer, and you’ll have to test across multiple email campaigns, but it will give you more reliable results. And it’s way better than just guessing. For those of you with small lists of less than 2,000, do keep reading. You can absolutely apply all the tips here to get better results. And just keep building your list until you can do regular split-tests. Also, don’t let this testing wonkiness turn you off. The next tips are easier to understand and involve way less math. We promise! 2) Include subscriber’s first names – either in the subject line or in the preheader. When you open up your inbox every morning, are you greeted by about a dozen emails calling you by name? It’s not an accident. 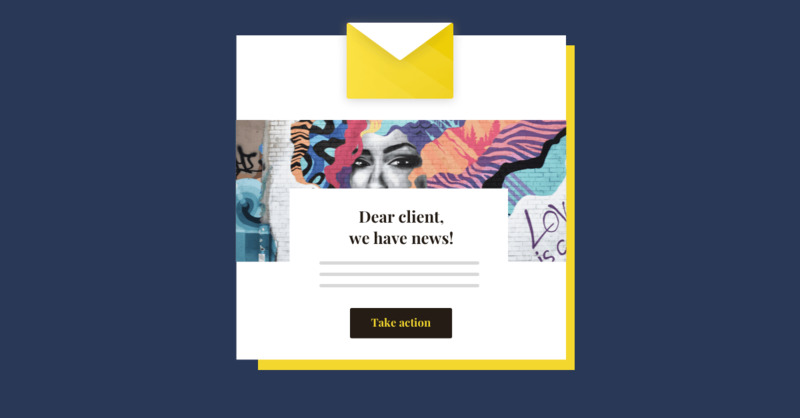 Email marketers use subscribers’ first names all the time – in the subject line, in the pre-header area (just below the subject line), in the email’s greeting and even in the body and the post-script. 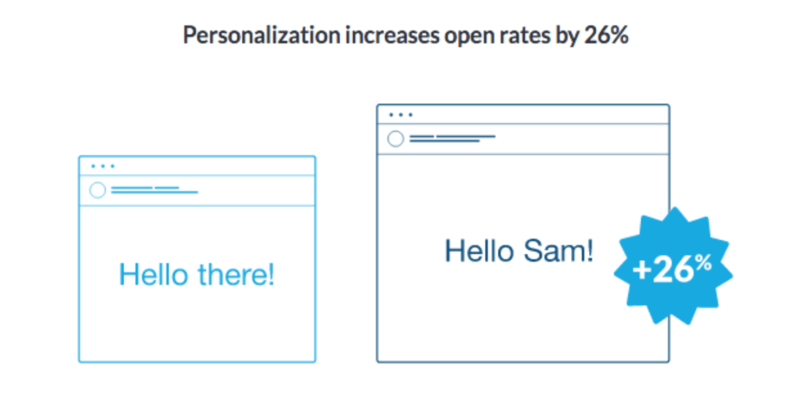 It’s easy to see why: Personalization increases open rates by 26% - or more. Of course, to use this information, you have to get it first. You have to know what your subscribers’ first names are. That means your email opt-in forms may need another field to include people’s first names. But given that including subscriber’s first names is one of the most-proven ways to increase open rates, maybe it’s worth going all the way back to the beginning of your email sign-up process to get this critical data. Relevancy is the secret sauce when it comes to email marketing. That’s why segmenting works so well. Research from MailChimp has found that segmented email campaigns get 14.31% higher open rates than non-segmented campaigns. 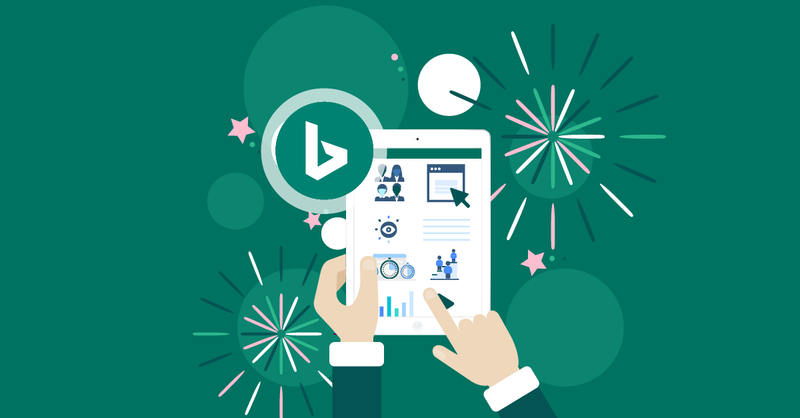 That’s good, but check this out: The click-through rates for segmented campaigns are 100.95% higher than for non-segmented campaigns. So segmenting works, and there’s a slew of ways to do it. And yet, only half of email marketers are segmenting their campaigns. 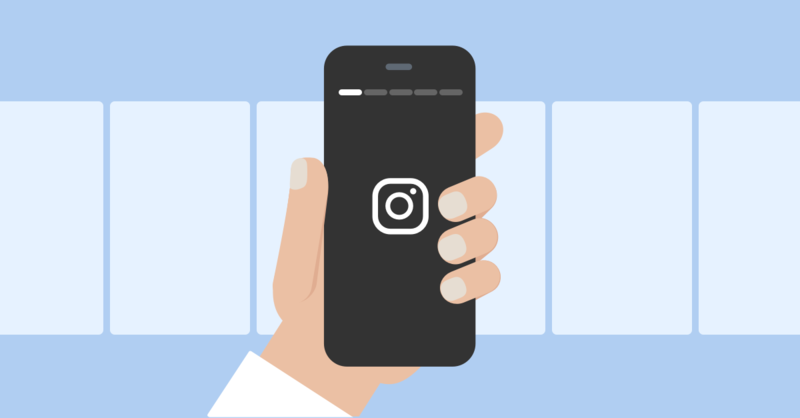 You don’t even need a lot of information about your subscribers to segment their campaigns effectively. 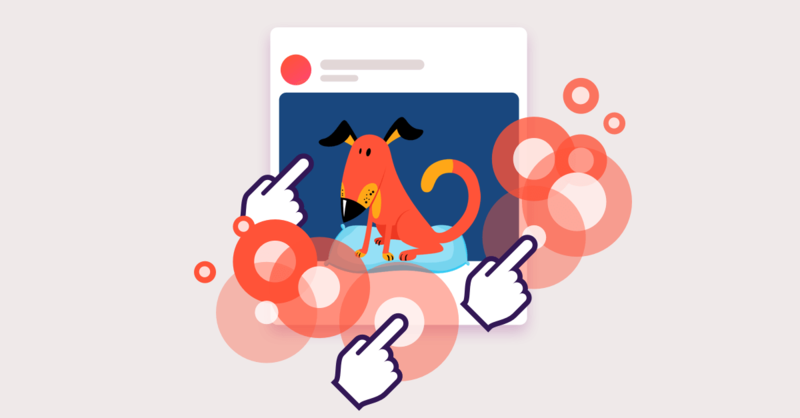 MailChimp’s research found that segmenting based on how long someone had been a subscriber is especially effective, for example. Or you can get an “overlay” of your list to find out where your subscribers live, and segment according to that. 4) Get your sender name right. This one is worth several tests. Because sender name is the #1 criteria for whether people open your emails or not. This is not a place to be cute or clever. If people don’t recognize your company name instantly in the sender field, they’ll delete your email. Changing your sender name a lot makes it harder to recognize. So while we encourage you to test this, test it once and stick with the winner. Try testing the difference between an employee’s name versus your company’s name. You’ll see a lot of emails with sender names like “Josie Baseball, XYZ Corp”. This could be a good choice or a bad choice for your emails. The only way to know is to test. You’ve got about 23 characters before your sender name will be truncated by some of the major email clients like Gmail. And truncated sender names make it harder for subscribers to recognize your email among the 300 other emails crowding their inbox. 5) Resend your emails to non-openers. Yes, you can do this. It’s not cheating. And if you re-send every email campaign to people who didn’t open, you will have a wee bit more work to do… but you’ll also probably increase your open rates by at least 20%. This trick usually works best if you change the subject line a little. It may also help if you send the re-mail at a slightly different time of day. Again, experiment with what works best for your list. But try it. This is probably the easiest way to increase your open rates by 20% or more. It only takes a few hours for the results to show up, too. Many of you already know that it’s smart to clean up your list every now and then – about every year or so. It’s called practicing “good list hygiene”. Good list hygiene works like this: You sort your list according to subscribers who have clicked or opened in the last six months, in the last nine months, and in the last year. The time frames are up to you, but you get the idea. When you have a count of how many subscribers fit into each group, you then… delete people who have stopped responding to your emails. To people who, for instance, haven’t opened or clicked an email from you in the last year. Lopping these people off your list means that, going forward, your open rates will be higher. Much higher. It also means you just lost a bunch of subscribers. But arguably, you had already lost them before. If this feels especially painful (it’s always a little painful), you can send a re-engagement email. This is an email targeted to people who have disengaged from your emails. For retailers, it sometimes includes a discount code, or even a free gift. 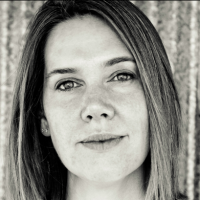 For agencies and B2B companies, it might include access to an especially valuable report. Give a re-engagement campaign your best shot, but don’t expect miracles. If you get even 20% of your disengaged subscribers back, you’ll qualify for the marketing hall of fame. Most re-engagement campaigns get 10% or fewer subscribers back. 7) Make the most of your preheader. Preheaders are sometimes called “the second subject line.” They’re the greyed text that appears below or after the subject line in the inbox, and they can do a lot for your open rates. All that grey text to the right of the subject line could be working much harder to convince people to open those emails. 8) Say thank you now and again. You’ve probably seen studies of which words work best in email subject lines. Here’s one example of a recent study that found using “thank you” increased email opens. Clearly, you can’t say thank you in every email, but you could send a “thank you for being a subscriber” when people have been on your list for six months. Or a thank you to all your subscribers for their responses to a survey. Using the word “video” in a subject line often gets significantly higher open rates (as much as 200-300% more, according to some sources. Again, take these studies with a grain of salt. They aren’t studies of your particular email list. But they’re definitely worth a test or two. 9) Experiment with when you send your emails. It’s one of the most common questions in email marketing: When should I send my campaigns? What time of day? What day of the week? While we could point you to a dozen different surveys about this (generally, weekends get the highest open rates), you really need to test this for yourself. As mentioned above, it doesn’t really matter how other lists behave – it matters how your list behaves. So run a few tests by sending emails on a couple different days of the week. Maybe Thursday is your magic day. Or even Sunday. In terms of which hour to send, see if your email service provider has a feature that customizes the send time for each subscriber. Some of the more sophisticated email service providers can actually crunch the data on each individual subscriber, and will send your email to each subscriber at the hour they’re most likely to open. It’s a nice feature that could easily net you 10% more opens. 10) Make sure your messages are worth the open. Are your emails valuable… or just one sale or product promotion after another? Are they easy to read? Do they look great on mobile phones? In other words, are your subscribers generally glad they opened your emails, or disappointed? There’s a rule in the online course industry that marketers should send four or five “give” emails for every “take” email they send. What that means is they’ll send four highly useful, actionable emails, then send one email that asks for a purchase or some other action. This balancing of give and take can apply to any company’s emails. To ad agencies, B2B firms, SAAS companies, you name it. It’s critical that we do enough giving in our emails so that our subscribers want to open our messages. If they don’t particularly want what we’re offering, or we’re always asking something from them… then all the other tactics mentioned here won’t help much. It won’t matter when you send the emails, or what you say in the subject line if your readers will have been pre-trained to expect a disappointing email. That’s not every single way to increase the open rates for your email messages, but it covers the best ways. As you’ve probably noticed, we’ve covered pretty much every aspect of email marketing while talking about how to increase open rates. Everything from how you handle signups to how long you hold on to inactive subscribers will affect how many people open your emails. That’s part of why open rates are so widely used to measure the health of a list – it’s a convenient one-metric way to see how well your overall email marketing strategy is working.